Home/What Happened to the Bulldog? 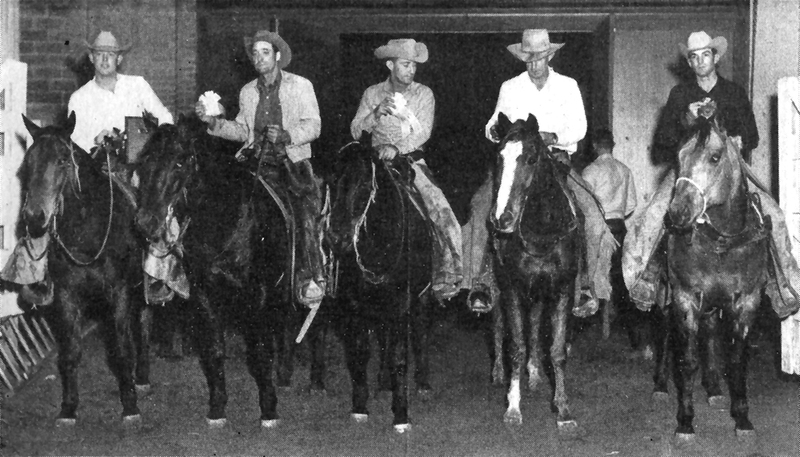 Left to right James Calhoun on Ceaser’s Pistol, Andy Hensely on Poco Bueno, Milt Bennett on Poco Tivio, Phil Williams on Skeeter and Matlock Rose on Jessie James. In 1940 American Quarter Horse Association was formed to preserve a ‘type’ of western horse commonly referred to as a “Steeldust” or “Bulldog”. These horses were rare and possessed certain characteristics that were unique enough to be a breed ‘type’ and to warrant the formation of a breed association to promote the ‘type’. When AQHA was formed the new Bulldog Type breed was tremendously successful. ask why it became necessary to start another association solely to ensure his survival. The first answer lies in the fact that AQHA never closed its’ stud book to Thoroughbreds, even though they had originally planned to do so – please read “The First 27,000”. Secondly, horse racing was a national pastime, with a lot of money involved, and the race men kept crossing more and more TB onto the Bulldog Quarter Horse. These were great crosses and produced more speed, as well as a horse that was taller, and more elegant than the little Bulldog. Due to the TB influence, the new crosses had longer legs, smaller feet, and a longer-thinner neck. These horses became the rage with the halter horse set, who were sweating off even more neck to satisfy the new fads, and breeding for a taller horse while maintaining the heavy muscling. In the 60’s QH names that contained words like Bar, Moon, Jaguar, Go, Dash, Jet, Rocket, Te, Three, Triple, Dial, Straw, and Eternal among many others became the norm. These horses all contained a high percentage of TB, and they dominated the show and race world. The typical Bulldog could no longer compete in the halter horse world because of the new fads, nor could he race with the TB crosses – nor could he earn an AQHA Championship that also required halter. Three Bars (TB) and his half TB sons were highly sought after for breeding. With the advent of Impressive (line-bred Three Bars and only 24% QH) and his sons in the 70’s, and 80’s the Bulldog’s fate was sealed. With the exception of cattle classes, they were looked down on as too coarse, and too short, for the modern show world. It fell to ranchers, recreational riders, cattle events, and a few Foundation Breeders to save the breed type and buck the trend. The show world (that set the standards for the breed) had no place for them. Presently the age of the ‘specialty’ horse is in full swing, with the halter horse, western pleasure horse, english pleasure horse and cow horse all having different conformation and different movement. There is no longer a breed standard or ‘type’. By 1995, when NFQHA was formed, True Bulldog Type horses were very rare. Many Quarter Horse owners had no idea how much TB was in their Quarter Horse, or that their Modern Quarter Horse bore very little resemblance to the original American Quarter Horse. Not only did the Modern Quarter Horse look different, but much of the wonderful temperament had been lost with the addition of the hot TB blood, and navicular and other foot problems became more prevalent as the foot got smaller while the heavy muscling remained. Today: Although the True Bulldog is still rare when compared with more than a million living Modern Quarter Horses, NFQHA is very proud of the fact that it is now considered a plus to say your horse is a Foundation Quarter Horse, and that it adds to the horse’s value. The historic Bulldog Type Foundation Quarter Horse is a “Made-In-America National Treasure”. NFQHA applauds all the current Foundation Quarter Horse breeders and owners that are preserving the extraordinary Bulldog Foundation Quarter Horse, with all of his unique breed type attributes! Without a doubt the wonderful disposition of the Bulldog was his greatest attribute. His temperament enabled him to be extremely versatile during a time in our western history when a horse was expected to perform many duties. ~ The typical Bulldog was 14 to 15 hands high with 14.2 being average, and was wide for his height with heavily pronounced muscling, and a deep ‘V’ between the forelegs. ~ Bays and browns were prevalent, with a few dun and palomino. Most had little or no white markings. ~ The neck was medium in length, and tied smoothly into the top of the withers (no dip in front of the withers). It tied in high on the chest, and the top had a slight graceful arch. The throat latch was clean. ~ The croup was sloped to match the well laid back shoulder, with a low tail set. ~ The fore legs were set well back under the body. ~ Length of the legs did not exceed the depth of the heart girth, which was deep. The foot was large enough to carry the weight of the heavy Bulldog. ~ The back was short with a strong loin. ~ The ears were small and his head was short with a small muzzle, and wide between the eyes. The jowl was pronounced. The eye was large and soft and set well to the side. ~ He was intelligent, easily trained, and was a user-friendly ‘people horse’. ~ He was hardy, and agile; with a quick start, and a smooth ride, with a rolling trot and lope. ~ He had natural cow sense.